Building and Facilities News is a publication that circulates 5,000 printed copies on a national basis to approximately 15,000 readers and sends out 20,000 eshots per issue independently. Our app is only available on the App Store for iOS devices. People that read the publication work in the key areas of the UK Building and Facilities Management sectors in such positions as Specifiers, Facilities Managers, Directors, Senior Buyers, Project Managers, Site Managers, and individuals involved in Buildings Management. 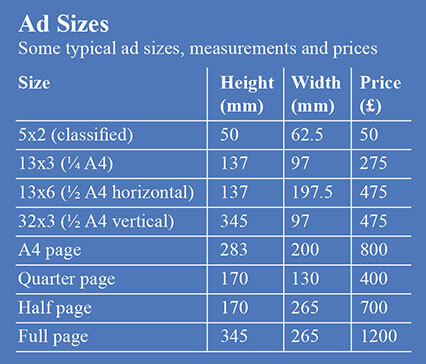 Page size = 390mm high x 285mm wide. Image size = 370mm high x 265mm wide (note this is not acceptable as a full page ad size). Full page ad size = 345mm high x 265mm wide. We do not print bleed anywhere. All pages have headers and footers. An editorial service/colour separation charge may apply. Discounts apply to agencies and runs. Proofs are only available on written request. An ad should be supplied to us as a high resolution PDF with all images at 300dpi or above, flattened transparency and embedded fonts, or as a high resolution JPG at 300dpi to the correct size at 100% (some common sizes are detailed right). Text should be supplied in Word document format. Pictures supplied to accompany large and small editorial pieces should be 300dpi high resolution JPGs, approximately A6 in size (105mm x 148mm), in either portrait or landscape format (files larger in size than this are acceptable, files smaller are not). We welcome high resolution logos in Illustrator EPS format if available. GIFs, PNGs, Powerpoint files, Publisher documents and low resolution imagery pulled off websites are not acceptable for print. Our email service has issues with files over 20MB in size; please feel free to use free online file delivery services such as www.wetransfer.com or www.mailbigfile.com instead. by phone on 0121 550 4593 or by fax on 05601 164195.